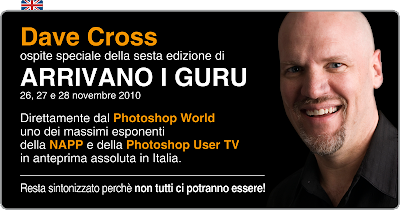 As of today, May 17th 2010, I am moving my blog over to my web site, www.dcross.com. I've actually had this web site since 1997, but hadn't done much with it in the last 5 years. Now, thanks in large part to a very helpful class by RC Concepcion over at Kelby Training, I've learned enough about WordPress to be dangerous. 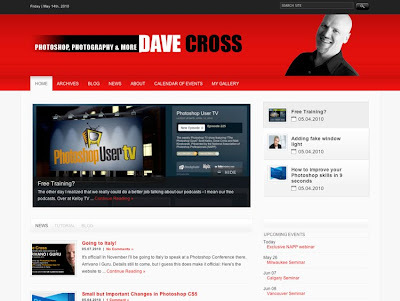 So if you've come here looking for the latest blog post from me, please head over to dcross.com. Please change your bookmarks etc accordingly. Westcott is proud to announce the addition of the following photographers into the elite group of Westcott Top Pros: Joey Wright, Ryan Gibson, Lindsay Adler, KC Gunn, Tri Huynh, George Simian, Michael Thompson, Erik Valind, Rafael Concepcion, Pete Wright and Dave Cross. The Top Westcott Endorsed Pros was developed for photographic education and inspiration. This elite group is comprised of talented photographers from around the world, each a master of his or her own creative specialty, including fashion, sports, wedding, nature, photojournalism, advertising, portraiture, food and travel photography. Most Top Pros share their photographic and technical expertise with eager audiences of photo professionals, hobbyists and enthusiasts in a variety of workshops throughout the world. 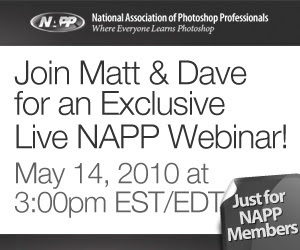 Tomorrow, Matt Kloskowski and I are hosting a NAPP member exclusive Webcast. It's Friday, May 14 at 3:00-4:00 est. We are presenting the Best of Photoshop User Tips and Techniques and taking questions via the live blog. Yup, it's hard to believe but my little boy turns 21 today. Wow. Happy Birthday Mike. I Love you! Normally I wouldn't describe something as "new improved", but in this case it fits. 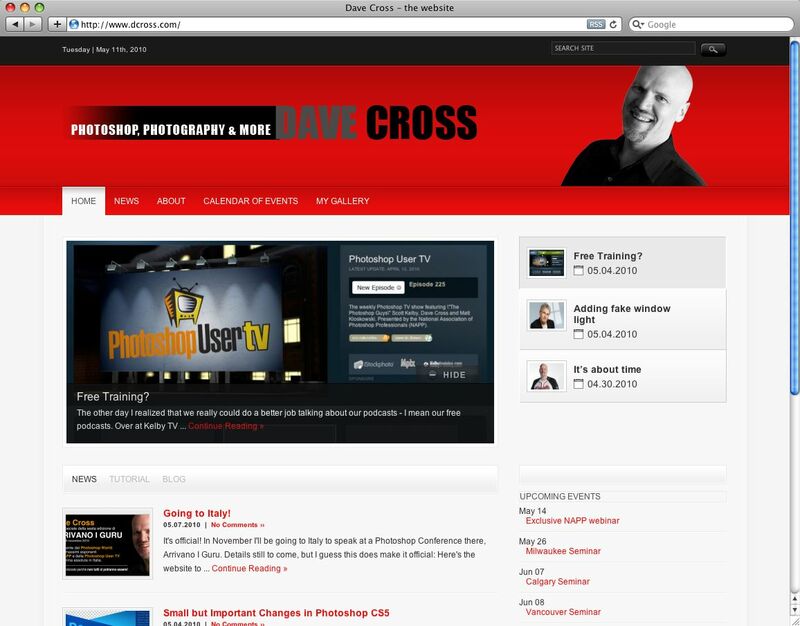 My personal website had not changed in at least 5 years - it was basically a single page with links to NAPP, Kelby Training etc. Well, recently I decided to venture into the world of WordPress and update my site. I gotta give major props to RC Concepcion - his Wordpress Basics for Photographers class at Kelby Training was exactly what I needed to understand where to start, how to work with themes etc. Every time I wasn't sure how to do something, a quick glance through the list of RC's lessons helped me find the answer. Then I found an inexpensive theme I liked from themeforest and I was off and running. I still have a ways to go in adding content etc, but so far I'm pretty happy with the results. So here's a few that I've recently received that I thought I'd answer here rather than on the podcast. 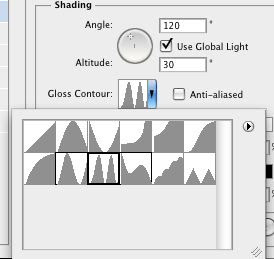 Q: surfkat54: Just got CS5 for mac and can't figure out how to make PS reside in a window rather than full screen - such a preference? A: The setting is Application Frame, found under the Window menu. Once it's chosen, it should become the default for every time you launch Photoshop. There is not a preference to set that as a default however. Q: ZParkar: Where is the Render > Lighting Effects on PS CS5? Q: ClaudeMyburgh: how do i make photoshop the default opening program in bridge CS4? A: In Bridge Preferences, choose File Type Associations and then go through and set the file formats you want to open in Photoshop. Q: Freedy77: hi i want ask how i can make a metal looking Text in Adobe Photoshop CS4 Extended ? A: I would do it using layer styles: bevel and emboss. The key to getting a nice metallic look is experimenting with Gloss Contours. Q: mkmacd: How would I go about making an image into tritone(?) where an image just has three different shades of green. A: Convert the image to a Grayscale and then go back to Image>Mode and choose Duotone. In that dialog you can choose Tritone and then click on each "swatch" to choose your color. Q: Derik Gutowski: Are you going to lead the Ybor photo walk this year? And if so, when will we be able to register for it? A: Don't know the details of the Photo Walk yet, although I know they're working on finalizing things. Stay tuned here at the blog. It's official! 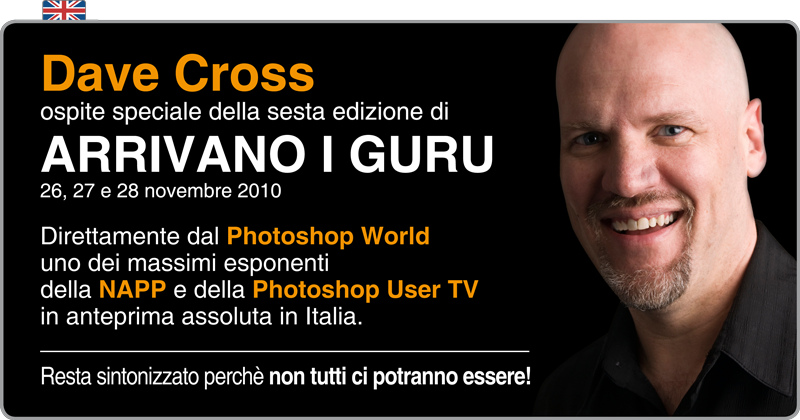 In November I'll be going to Italy to speak at a Photoshop Conference there, Arrivano i Guru. Here's the website to bookmark for more details.